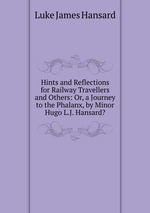 Hints and Reflections for Railway Travellers and Others: Or, a Journey to the Phalanx, by Minor Hugo L.J. Hansard? Аннотация к книге "Hints and Reflections for Railway Travellers and Others: Or, a Journey to the Phalanx, by Minor Hugo L.J. Hansard?"